Born: September 21, 1824 in Charlestown Ma. Died: March 5, 1900 in Bourne Ma. at 75 yrs, 5 mos, 13 d.
1. 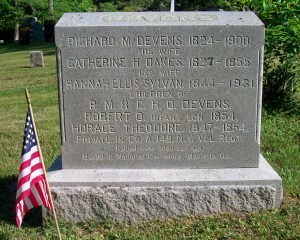 Horace Theodore Devens, Civil War; (1847 – 1864); Horace is buried in the National Cemetery at Marietta Ga.; Horace’s name is on the headstone with his parents & brother, Robert O. Devens, in Cataumet Cemetery. To: Hannah A. Ellis; (1844 – 1931) (Anson Burgess Ellis & Harriet Newell (Howes)); Hannah married (2) Joseph Sylvan (1821 – 1919) (Manuel Sylvan & Joaquin Louise (–)) in Norton Ma. on April 2, 1901; Joseph married (1) Hannah Howes (1828 – 1894) (Nathan Howes, Capt. & Lydia Sears) in Dennis Ma. on November 17, 1859; Hannah A. Ellis is buried in Cataumet Cemetery; Joseph & Hannah Howes are buried in Dennis Village Cemetery in Dennis Ma..